They married on a whim, and then she disappeared from his life. Now he’s determined to find her and convince her to make their marriage work . . .
It’s all happening for Hannah Hastings. After ten years of slinging drinks, she’s about to go from bartender to bar owner. But before she can sign her name to the deed, a blast from her not-so-distant past comes blowing into her hometown of Yachats, Oregon. It’s Grant Laythem, the man it seems she can’t resist. And he’s come looking for his runaway bride . . .
Set to inherit a multi-million-dollar company, Grant is used to women wanting to get him into bed—and get into his bank account. But not Hannah. Bedded, wedded, and abandoned after a passionate two-week fling, he never even had the chance to tell her who he really was. All he knows is that she wanted him, no strings attached. And now that he’s had a taste of something real, he’s not about to let it slip away. Can Grant convince her to give their marriage a shot? Or will Hannah continue to run from the only love she’s ever known? 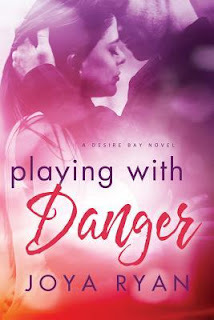 PLAYING WITH DANGER is another series set in small town America which I have found that I really enjoy. I couldn't imagine living in a small town but it is really nice and soothing to read about people that all know each other. While each book focuses on main couple, the reader is given the opportunity to check back on the other characters that they have met. Hannah and Grant know that they love each other but their lives are so different that they are not sure if they can meet in the middle. Grant manages to exact a promise from Hannah that they will take two weeks to see if they can find a way to make their marriage work. Of course neither is exactly honest with the other while they are 'playing house'. I rather enjoyed PLAYING WITH DANGER for both the characters and the town itself. This book does a fine job of standing on its own merits but if you would enjoy spending more time with the town and its denizens then be sure to read the first book in this series Playing with Trouble also.